Starbucks Veterans Initiative: Free Coffee for Veterans; Partner Roll Call; Veterans Card; Donation to Onward Veterans. Last month, I got to see the Veterans Honor Wall at the Starbucks headquarters. 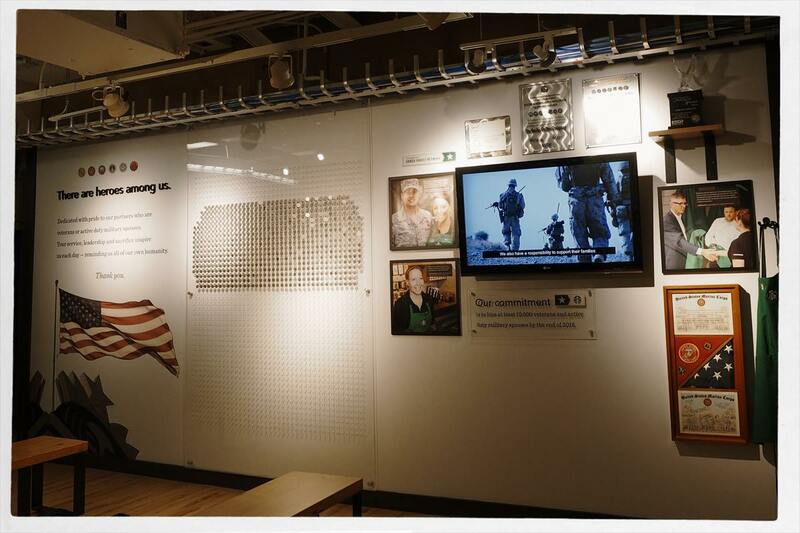 It as an area to honor Starbucks partners who are veterans, active duty and military spouses. I met with Starbucks Support Center partners who filled me in with what Starbucks is doing with their Veterans’ Initiative. I was impressed by what I saw and heard! First things first: This Veteran’s Day, participating locations in the U.S. will offer a free tall (12 oz) brewed coffee to veterans, active duty service members. Next, I want to mention is Starbucks “Roll Call.” This is for current partners only: sign up and designate yourself as a veteran, reservist or military spouse. 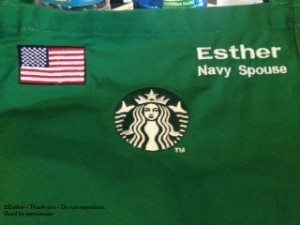 Starbucks is sending military veterans and spouses a special honorary green apron, showing their status as a military spouse or branch of service, if they have served. If you are a partner reading this, and you’re a military spouse, reservist or veteran, please sign up! Thank you partner Esther for sending me a picture of her apron! Anyone can “like” the Starbucks Armed Forces Network Facebook page. If you are a current partner, you can find out more information by emailing AFN@Starbucks.com. Starbucks says that they will hire 10,000 veterans (including military spouses) by the year 2018. I asked about the definition of “veteran” while I was visiting the headquarters and I learned it’s “anyone who has served.” I know that sometimes people think of veterans as people who perhaps have served 20 years or who those have been in combat. I’m of the strong belief that everyone who signs on the dotted line and serves honorably, is a veteran. A volunteer is always gambling that there won’t be a war or conflict ahead, and one who served in peaceful years had no way of knowing that he or she would serve during peaceful years at the time that he or she volunteered for active duty military service. I fully agree with the broad definition of “veteran”. 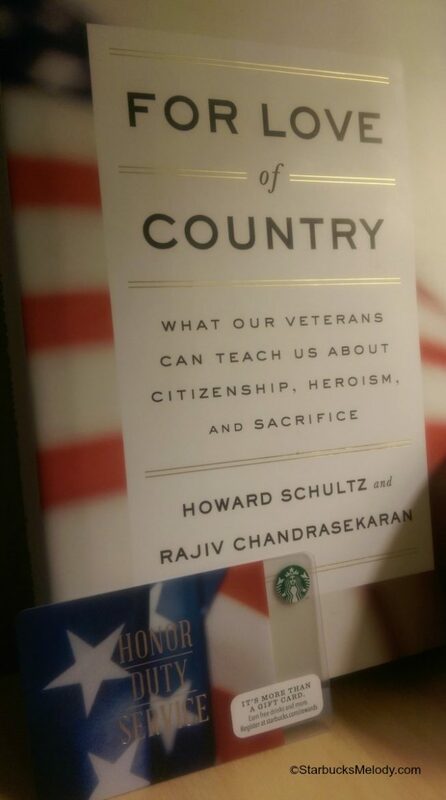 For each Starbucks Veterans card activated and purchased November 4th through the 11th, Starbucks will donate $5 to the Onward Veterans foundation, which is an initiative of the Schultz Family Foundation to donate money to good causes that support veterans. Released today, November 4th, be on the look out for a new book in Starbucks stores called For Love of Country. 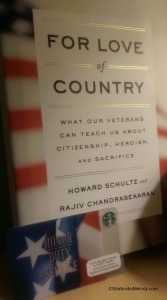 Written by Howard Schultz and Rajiv Chandrasekaran, it chronicles powerful and important true stories of service people who made amazing sacrifices in the line of duty. I have already read the book – I received a copy early on my visit to the Starbucks headquarters. (Legally, I have to tell you that I was given the book as gift from Starbucks, but this did not affect my review of it). You will love it. You’ll cry. The majority of the book walks you through true stories of heroes, enlisted and officer, who lost their lives or limbs to save others. Towards the end of the book, it transitions the reader to the concerns of military veterans who come home: families dealing with a injured loved one, post traumatic stress disorder, and traumatic brain injury. The draft ended in 1973. We have an all volunteer service. People join for many reasons – money for college, a family legacy, or a desire to serve their country and more. The military is its own complete ecosystem. It takes every person from dentists, to cooks, to interpreters, to infantry to make the military work. The percentage of people who volunteer is tiny. Research says less than 1% of Americans currently serve the military, and less than 10% of the U.S. population is veterans. Of the small percentage who are veterans, the overwhelming majority of male. Every single person who joins the military will walk away with life-changing stories (regardless of what their profession was in the service) and takes a risk of war or conflict. 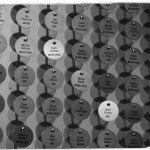 For Love of Country brings these conversations to forefront: how to honor veterans. From organizations like the Injured Marine Semper Fi Fund to the Starbucks hiring initiative to the Rubicon volunteer group, we have to constantly ask what can we do to make a difference? But most of all, Veterans are leaders. We can learn so much for them. I fear that too often we hear the word “veteran” and think of a stereotype. 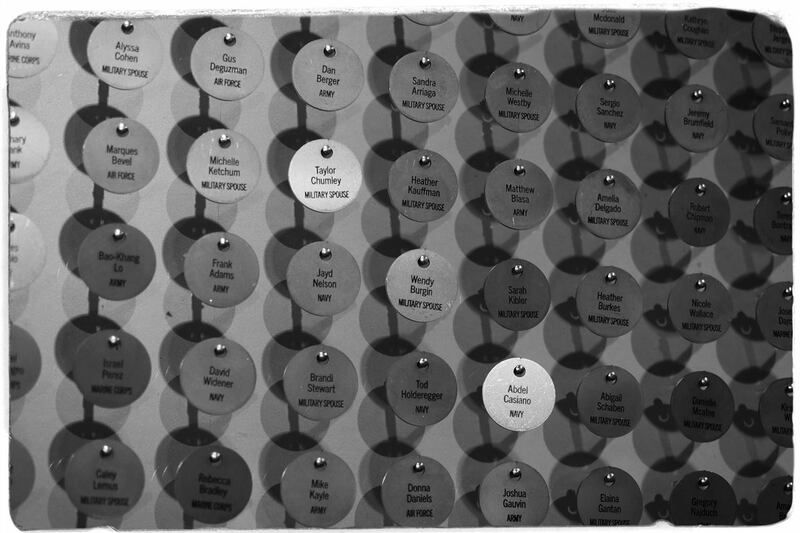 “Anyone who has served” can be many different people. I was reminded of this perception or stereotype that veterans are retiree age who have been to war. I like what Starbucks is doing in being very inclusive of their definitions. I hope they change how people think about military service. I’ve rambled a bit but I hope you’ll go get the book For Love of Country and read it. If you plan on buying the book via Amazon.com, please consider using the link in the right rail of this website. 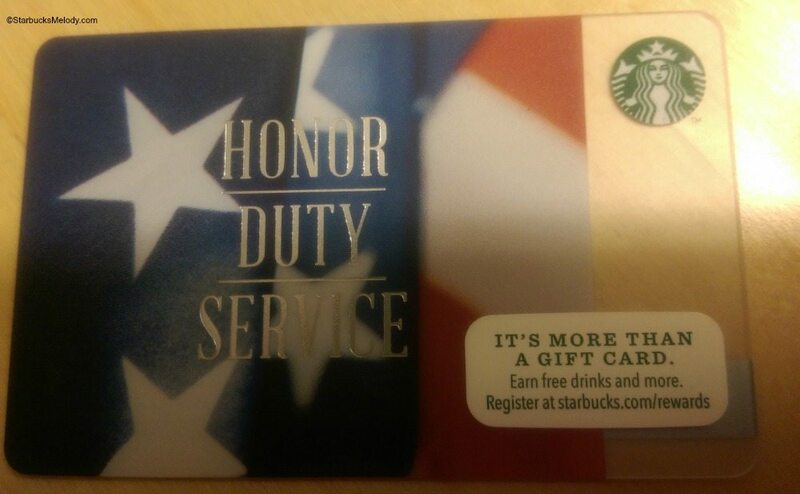 For more information, visit http://starbucks.com/veterans. Four Years Have Flown By. Just came back from my local SB and saw the new veteran’s day card and the book. Very nice and I am glad to see what SB is doing especially the wall at corporate and the aprons. On another note, Melody did you ever pick a winner for the most recent contest? @Purple1 and @Denise – The winner was a woman named Sherry who lived in Oregon. A customer. I had posted something on Facebook and she got in touch with me immediately so I didn’t post anything else about it. I hope she enjoyed the child’s size apron! This is LONG overdue by Starbucks! Love the newest card and will be buying several! As a proud Navy mom this is the right way to go in customer service! @Denise @Purple1 @Sandra Trolinger – 🙂 It IS the right thing to do! This is a win win. 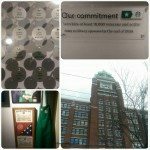 Made a special trip to sbux after reading this post. Just activated 20 cards at $5 each to hand out to veterans and the homeless. May do more… If for each Starbucks Veterans card activated and purchased November 4th through the 11th, Starbucks will donate $5 to the Onward Veterans foundation …. money goes to needy and to do good causes that support veterans. A great looking card as well. Thank you for letting us know about the card. What a great idea- I did the same last thanksgiving when I saw all the young service people still in fatigues stuck at the airport waiting to get home or report back with orders. Figured it’s the least one can do to offer coffee or croissants. The cards seem to work at all Starbucks- even the ones overseas- so it’s nice to know if money needed while stuck at Heathrow or one of the other airports with Starbucks, don’t have to change more money just to grab coffee. Re: buying Starbucks cards for vets. What a great idea- I did the same last thanksgiving when I saw all the young service people still in fatigues stuck at the airport waiting to get home or report back with orders. Figured it’s the least one can do to offer coffee or croissants. The cards seem to work at all Starbucks- even the ones overseas- so it’s nice to know if money needed while stuck at Heathrow or one of the other airports with Starbucks, don’t have to change more money just to grab coffee. Awesome! I’m so proud to work for this company! I’ve got some pictures of my veteran partners displayed near the book display so we can connect with customers over the veterans promotion. Can’t wait to read the book. Thanks for postings all this great info!! And don’t forget about the concert of valor on HBO! @CamSpi – That is a great idea! 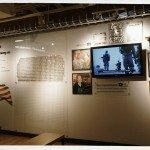 What a fabulous way to connect your veterans with the current veterans’ initiative!! @Christopher – Read it and then post what you think of it! !